Marketing research continues to show that the word FREE is the number one perceived successful word. 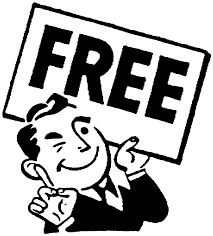 Therefore the vast majority of marketing campaigns offer something for free. The free offer is basically a cliché at this point. I would submit that the attraction to free is the beginning of exposure to potential financial victimization. Together let’s take a counter-intuitive review of the concept of free and see just how it can lead to unintended consequences. There are several definitions for the word free. 1. as an adverb: without cost or payment. 2. as an adjective: not under the control or in the power of another; able to act or be done as one wishes. So here is a thinking point for you to consider when you accept something for free (in the sense of the adverb) are you under the control or in the power of another or are you free (in the sense of the adjective)? When we consider the psychological triggers that are manipulated to create financial victimization I would submit that the acceptance of a free offer creates a non-free relationship and therefore opens the person who receives the free offer up to potential victimization within the relationship. The reality is there is no true value in free. (This doesn’t mean that freebies are bad or you shouldn’t accept them, just understand what value they truly offer) The very definition states this fact, as it is without cost or payment. Whenever value is exchanged there is a determined cost and exchange of compensation for service or other form of value. Since the beginning of mankind this exchange has existed and it always will. What has happened is we have been hypnotized into believing we can receive value for nothing in exchange. This is the underlying belief that opens us up to financial victimization. Free is never free. When you receive a form of value and give nothing in return you have indirectly disrupted the flow of abundance and create scarcity. There is always an equal and opposite effect so when scarcity is created it continues to develop more scarcity. When we disrupt this flow we open ourselves up to financial victimization. I’m not suggesting that free is bad, I’m attempting to fully define what the consequences of free are. Relationships are based upon trust which is a form of consideration. Trust suggests that both sides of a relationship are consistently treated with equal respect and provide equal value to one another. In any financial decision a true relationship will create a fully functional equation. This means the values on each side of the equation will be equal. In a manipulation, scam or fraud there is always full value on one side and zero value on the other. It is a zero sum game which in the end creates a financial victim.